Science-fiction fevers, get ready to race. Star Wars: Episode One's fans (not much, I guess), here's the game that might have inspired George Lucas when he did the module's race in its movie - let's say the best part of it! We are in the twenty-sixth century after Jesus-Christ. 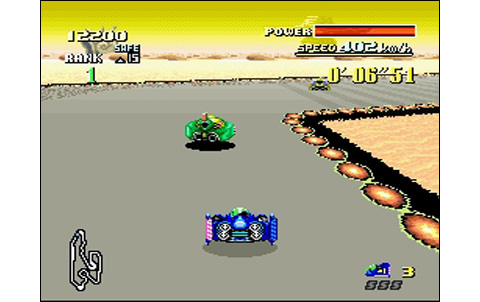 The world is no more the one we used to know, and the creatures who live in it have a little changed too... Race cars and Formula 1 are distant memories, almost good to be exposed in museums: now, the Formula Zero reigns! 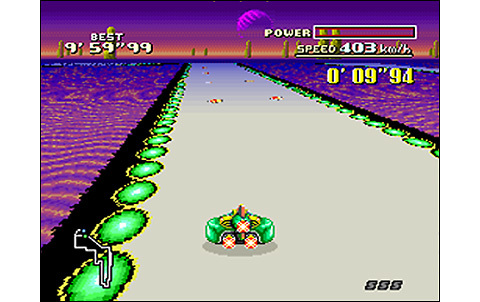 Super powerful hovercrafts are racing at a few centimeters of the ground, rushing over 300 miles per hour on deadly speedways. The competition takes place in the whole galaxy, welcoming all kind of racers coming from planets all over the universe. 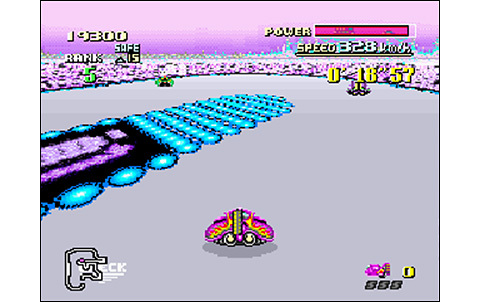 F-Zero offers to play as one of the four favorite pilots in this competition, and getting behind the wheels of one of these insane ships! 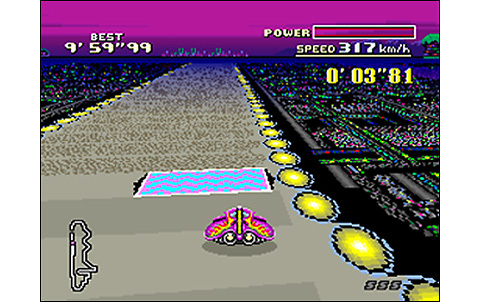 Among the eminent personalities of the F-Zero racing world, players can choose to play Captain Falcon in command of the Blue Falcon (surprising, isn't it) or Dr. Stewart and his Golden Fox; there's also Pico the extraterrestrial with the green Wild Goose , or the chubby Samurai Goroh driving the powerful Fire Stingray. 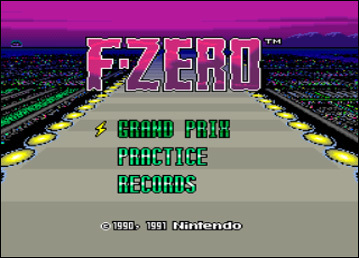 These are the four drivers available to enter the three glorious F-Zero championships. 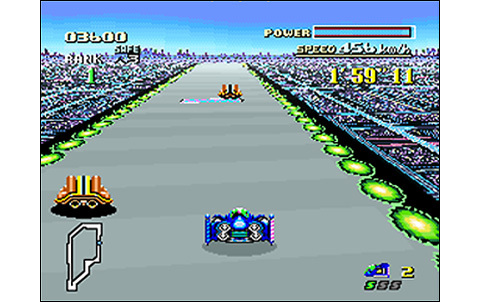 Each race pits you against twenty other drivers for a total of five laps. 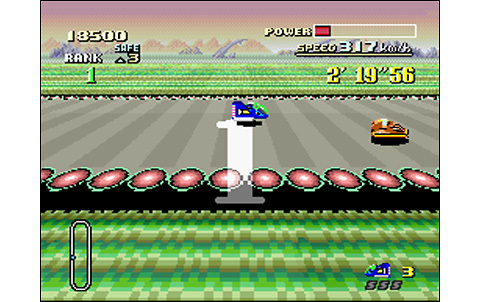 For each one passed, some competitors are eliminated, leaving only the top three for the final lap. 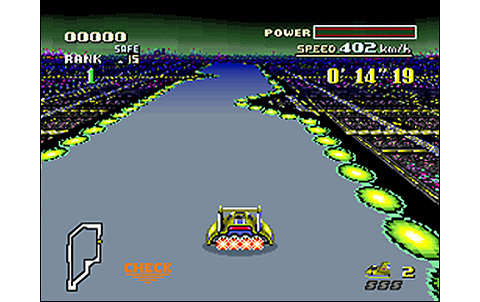 Each turn you pass the line, you're granted a turbo: use it wisely... Shocks with the opponents, mines present at certains places of the circuit, or contacts with the edges have the vessel losing energy. A charge area is available on a few hundred meters at the beginning of each track, at the same place where would have been the stands in our old races. It won't be easy to overcome these tough opponents, as they show no mercy, especially to you. 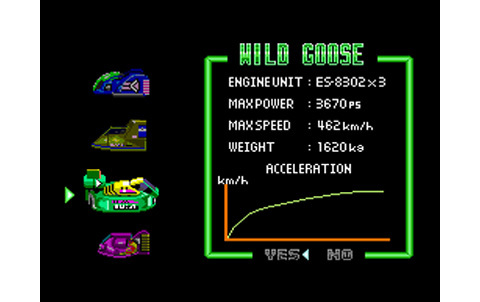 Nothing allows to think that on arrival drivers will be this very same number, as each ship has an energy bar, rechargeable through the pits on each turn. It would be better to ensure that this bar doesn't empty at any time, as this would result in the pure and simple destruction of the machine. 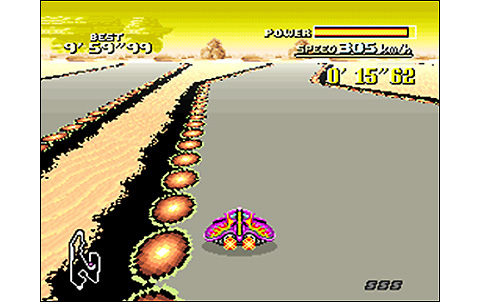 In addition, some tracks are full of traps, sometimes you'll even have to jump over dangerous void zones, avoid mines, slippery areas, explosives vessels... while the trajectories are still quite important to get the best time. Especially if you come to play with the ultimate difficulty setting, the Master one: your rivals will be very hard to beat, be warned! About the controls, in addition to the accelerator, there's of course a brake, a button for the turbo, and the right and left triggers to incline the ship and gain a few more seconds in the curves. 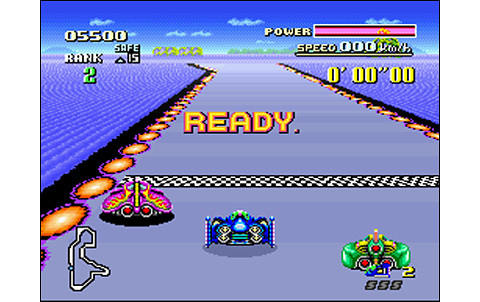 It's somewhat a technical racing soft, which requires timing, precision and at times holy reflexes! 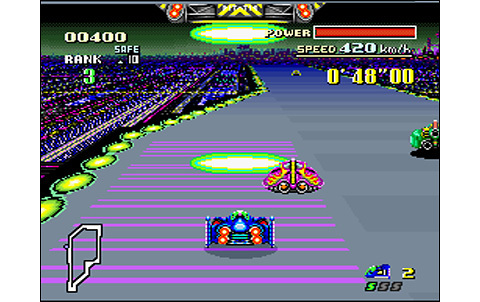 Let's also remember tha the realization of the game was revolutionary back in 1992, and the Super Nes mode 7 had many players fantasizing on it. 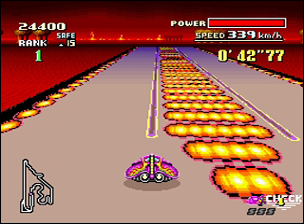 This 3D before the time allowed many of these kind of creations on the system (Exhaust Heat 1 & 2, Mario Kart, and F1 series) but as the time goes by, F-Zero still stands as the best of them. Its futuristic atmosphere fits perfectly with the mode 7, the view used is perfect, the difficulty high enough to maintain an interest for days and days, and there's of course the gameplay, taking and comprehensive. 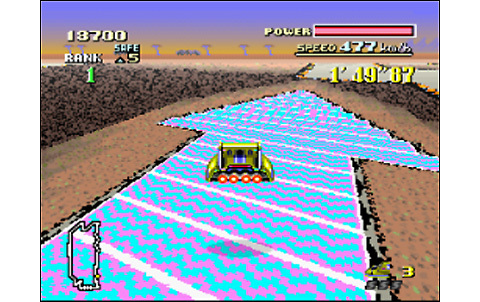 Yes, the challenge is hard: there's three levels of difficulty right from the start (Beginner, Standard, Expert) and three championships to clear featuring five different tracks each. 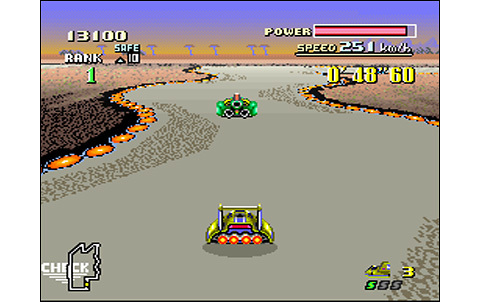 But there's also a 'Master' mode to unlock, by winning all the races on Expert difficulty first! 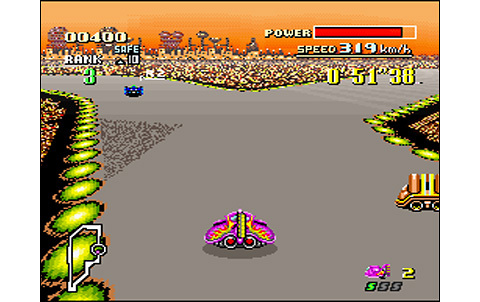 Futuristic atmosphere, successful graphics, hyper fast and fluid animation, nice musics... Shigeru Miyamoto strikes again! The four ships behave differently and each of them is worth to try again the championship, even when cleared once. 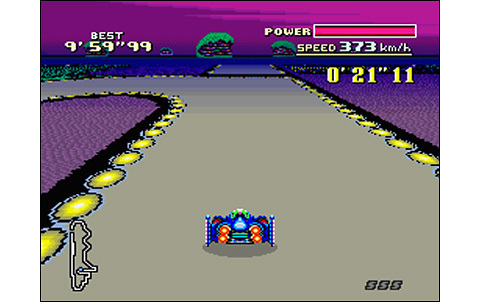 F-Zero is a great hit that has aged pretty well, standing as a good challenge with perfect controls and good sensations. Too bad you can't play it with a friend: that's the only thing the game misses. Mode 7 render is not very fine, but the result still looks good, futuristic at will! Unique! In 1991, no other system can offer such animation. 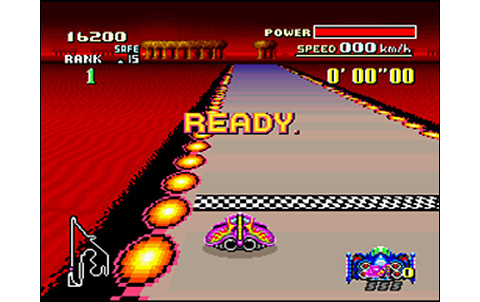 The speed sensation is fabulous, offering an awesome rythm to the races. Synthetic themes are excellent, very inspired and fitting perfectly the high-tech atmosphere. The FX are pretty basic, but still decent. Four ships, three championships, fifteen different races and four levels of challenge... Too bad there's no 2-players mode, this would have been perfect! Controls respond with perfect precision and require a good timing and some anticipation. 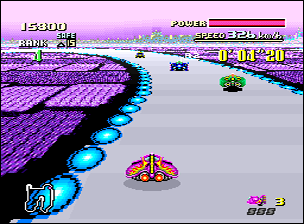 Races are breathtaking and the difficulty is high, it's all fine. 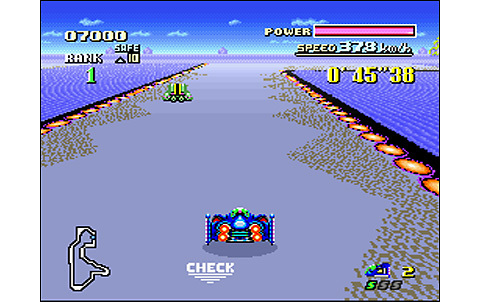 Incredible title in its time, F-Zero motivated millions of Super Nes sales by itself! 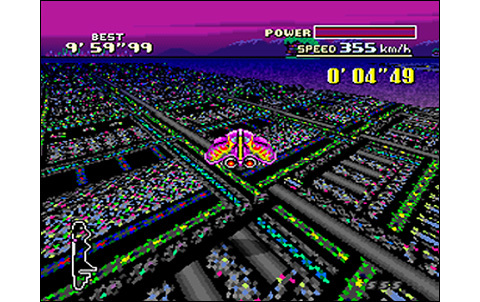 Super NES mode 7 was without a doubt an unique feature back in the time, allowing the 16-bits to realize a sort of 3d before the time. So, there's no similar game on the Neo Geo looking like the Nintendo title and its futuristic atmosphere.